Wednesday was swirling by too quickly, and after reading a couple magazines and catalogues at the shop, Katsu and Hammer wheeled out this little old bike. I guess I looked bored, or maybe they knew that I needed to go for a spin. Either way, it was really cool to check out this vintage bike. Faded paint, loose hardware everywhere (like the bars! ), it was something else. After airing up the tires, the boys told me to take her out, so I did! At first sight, I was a little scared, because I thought, what kind of bike is this?!? 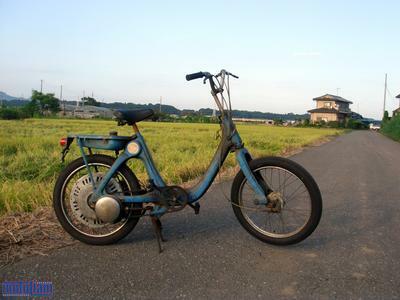 I really tried to give it a good inspection, and it turns out that this little thing was an early Sixties Honda! Everyone knows I have a thing for little motored Hondas, and this was right up my alley. I had fun bouncing down the roadways, cutting in and out of the neighboring fields, and with it's bouncy, spring only suspension, it was a real throwback in time. I could almost imagine that time hadn't passed, and that I was zooming around on something more modern, because everything still worked! 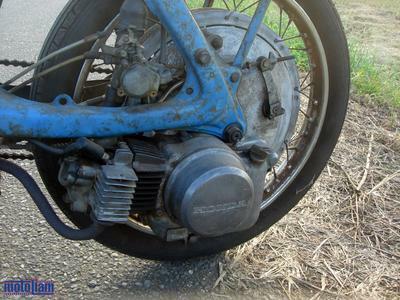 Ok, maybe the brakes were a little worn, or the brake shoes were glazed, but it felt sooo good to be back on two wheels, and under power, too! Under Power? Hell yeah! 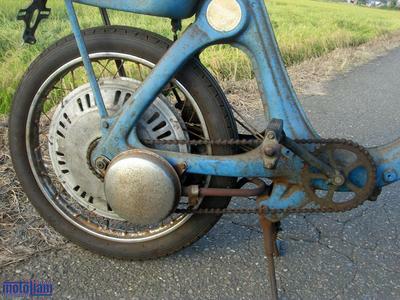 That little frying pan looking thing is the muffler, and when you take a good look at the rear wheel (inside), you can see that it's actually the generator for the bikes electrical system. Just flip a switch on the motor and pedal to get it started, and Vroom! You're off! It took me a little while to get accustomed to it, but once I was rolling, everything was just second nature. To be alone in the wind, the smell of the ricefields, the sun shining, it was amazing. No thoughts about horsepower, or who's watching, or where I was going - just putting along to the tune of the engine. 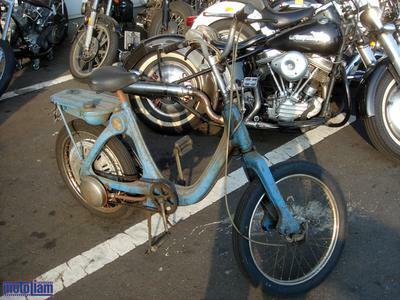 I think technically this might be a moped, because there weren't any gears to shift through, but I'm not picky. Two wheels? Motor? That's a bike in my opinion. No front fender? Hmmm, maybe it's a chopper, hahaha. Another amazing Honda 50cc. What kind of journeys has this bike taken before, and who has it carried - to work, to school, to a girlfriend's house? 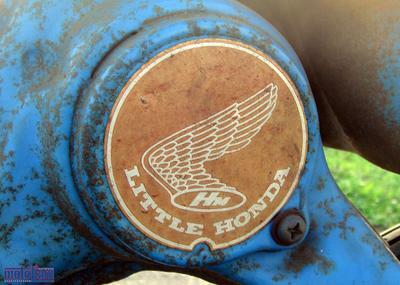 One look at the engine and it's obvious that this is unmistakably Honda. Who else has ever made so many cool 50cc machines? I love it! I needed to get back to the shop eventually, so I took a few pictures and then headed back. At Max Speed! 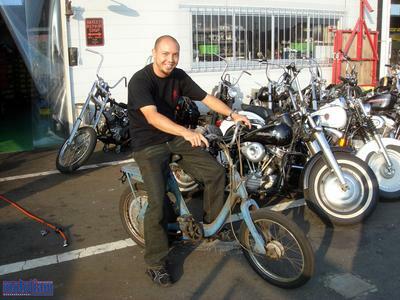 I don't know how fast I ended up going, but it was a riot just getting the bike cleared out and doing it's best. Huge Thumbs-up to this bike. To be away from everything, even for just a couple minutes, and to be riding in the country, was truly something special. Life is special.